In November 2015, I was lucky enough to have an essay on Blakes 7 included in the frankly wonderful collection You and Who Else. This volume is the latest in a long line of collections that have covered many aspects of Doctor Who fandom. 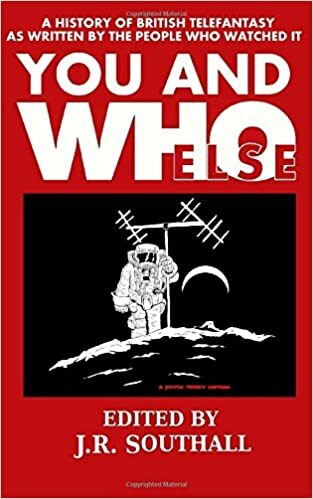 This time, editor J. R. Southall put together an exhaustive compendium of essays on virtually every British telefantasy series that has ever been broadcast, going right back to the beginnings of TV in the 1950s and covering series broadcast only weeks before the book’s publication. The proceeds from this You and Who book go to the Terrence Higgins Trust. My essay on Blakes 7 (pg. 322) is called The Third Century of the Second Calendar. I could include the essay here (the rights reverted to me upon publication), but I’d prefer it if you bought a copy to maximise the proceeds raised for the charity. To buy a copy of this book on Amazon, click here. And please do buy a copy – it’s a staggering work by many writers that collectively constitutes a truly moving love letter to British sci-fi and fantasy. Rarely have I been involved in such a genuinely impressive collection. It is an honour to have my name associated with this volume. Contributors include: Phil Ford, Keith Topping, Paul Castle, Mike Morgan, Christopher Bryant, and many others.